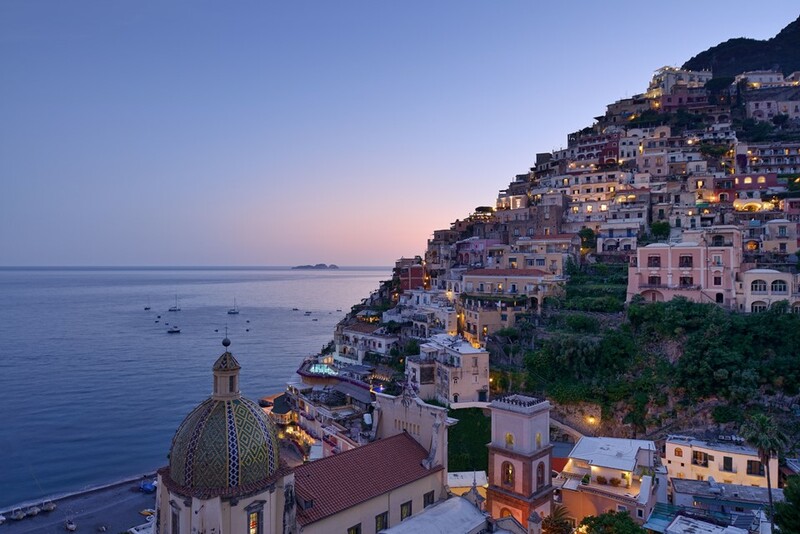 The Amalfi coast and its dramatic mountains dropping a thousand feet into the blue sea, epitomise a classic Mediterranean holiday. 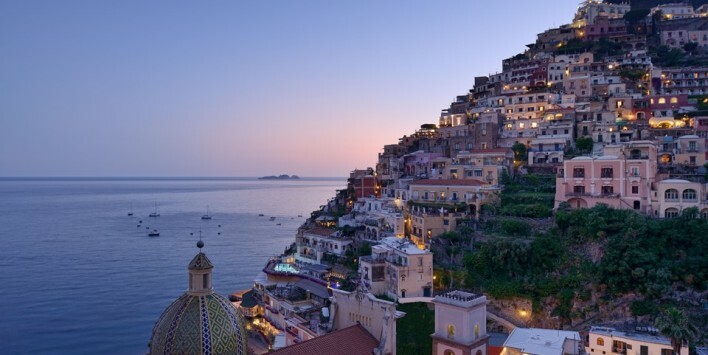 The middle ages and the renaissance brought vast riches to the towns of the Amalfi coast, but more recent history has brought movie star glamour – the Amalfi Coast began to attract Hollywood A-listers in the 1950s and the steady flow has continued ever since. 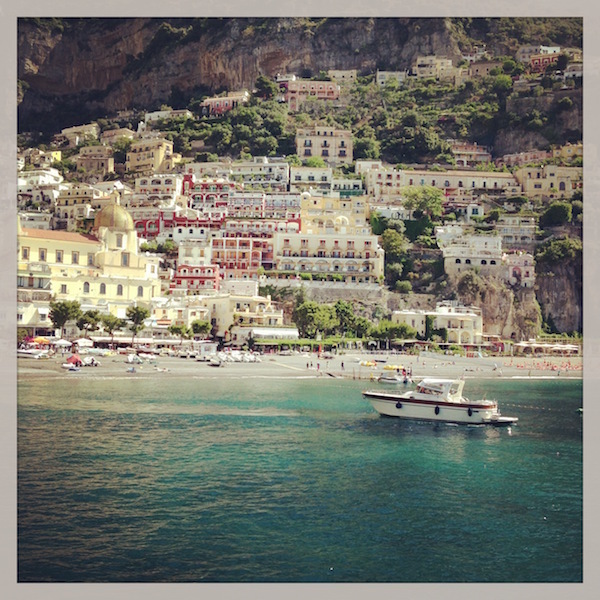 The main gateway to the Amalfi coast is through Naples, which is 90 minutes away by car. The place to stay in Naples is the Romeo Hotel, which manages to add some upscale charm to the city of Naples. 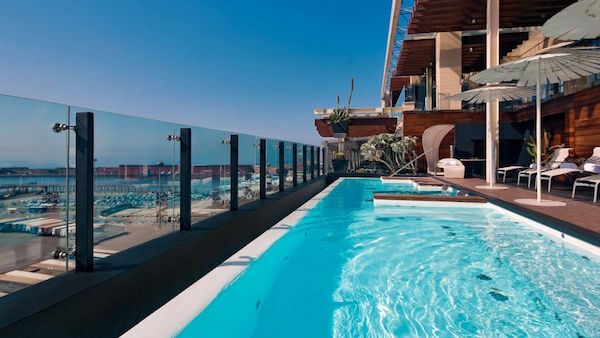 Enjoy a cocktail in the rooftop pool bar, dine at the Michelin starred restaurant with views of the port or visit the 10,000 sq.ft spa, the hotels hidden gem, which includes a Finnish sauna, infrared sauna with Himalayan pink salt walls and various Jacuzzis and treatment rooms. Driving around the Amalfi coast is a memorable experience: much time is spent testing the car’s gearbox to steadily climb the wall of mountains standing between the Italian mainland and the coast. The mountains are high enough that their peaks are generally surrounded by gently caressing clouds, which open to reveal one of the world’s most spectacular vistas. A steep drop to the blue and brightly shimmering Mediterranean Sea, with villages dotted around the hills and terraced vineyards and citrus orchards as far as the eye can see. (Some of the these photos are from my Instagram account – click here to see more). Best seen from the sea, the view of Positano with its brightly coloured buildings offers the quintessential view of the Amalfi Coast. One of the best places to stay in Positano is Il San Pietro, which is simply beautiful thanks to its exceptional location and views. The hotel’s pretty decor mixes modern design with magnificent antiques and elegant tilework. The hotel has 57 rooms and 6 recently refurbished suites, which are decorated in a modern Mediterranean style. The light and airy suites are awash with bright whites and seaside-inspired colour palettes. Every suite has its own private balcony with views overlooking the coast. Make sure you have lunch in the beach side restaurant where food is served with a backdrop of crashing waves and blue as far as the eye can see. 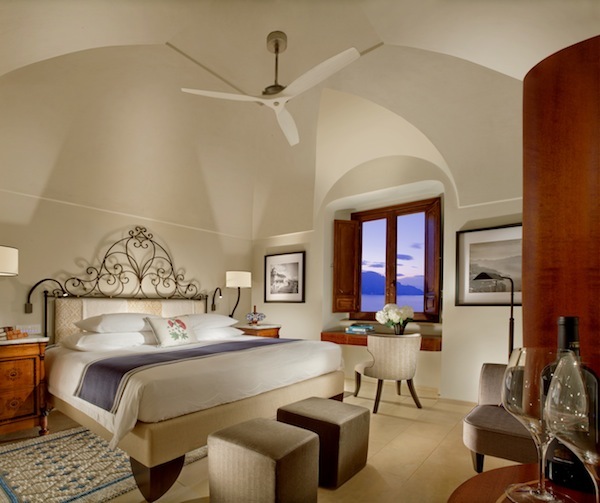 Il San Pietro’s location makes it a truly unique and spectacular hotel. 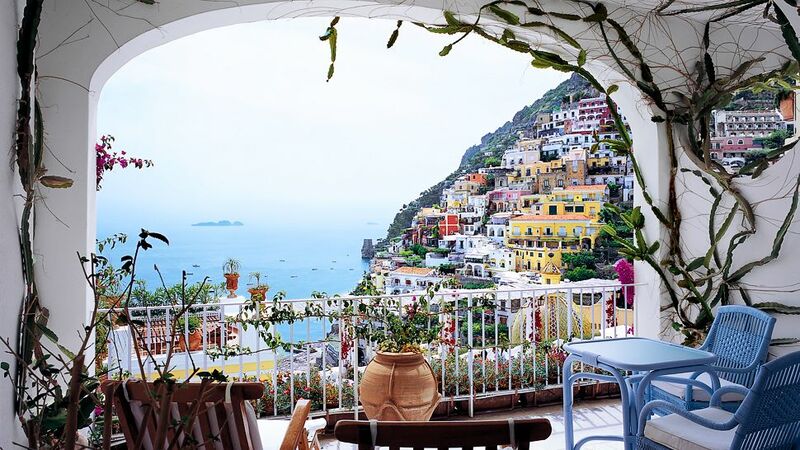 For help with planning your next trip to the Amalfi Coast, contact Bon Vivant’s luxury travel team here. Le Sirenuse opened in 1951 when four Neapolitan brothers turned their summerhouse overlooking the bay of Positano into a hotel. 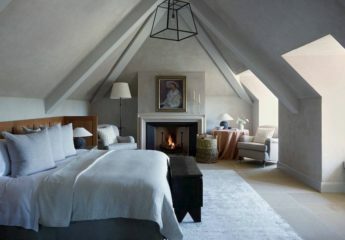 Today the charm of the 58-room property lies in the intimate atmosphere of a private home that it has managed to retain. All 58 rooms are different from one another and are decorated with antique and contemporary furniture pieces from Europe and the East. 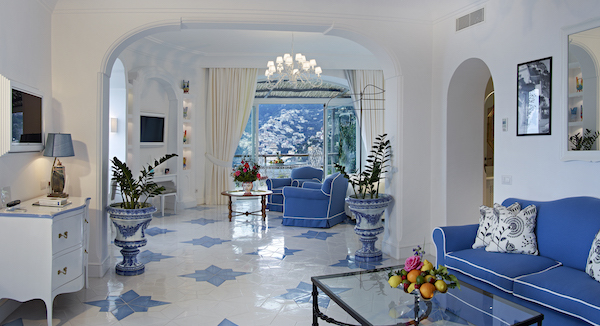 The rooms and suites are decorated with bright white walls and gleaming Vietri-patterned floor tiles. Almost all bedrooms have a private balcony that looks out over the pool to the sea. 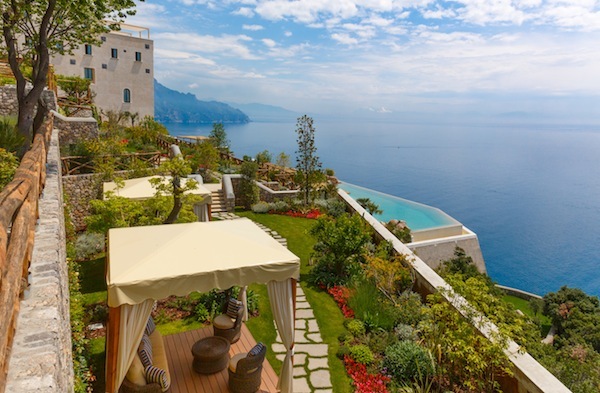 Located just outside the town of Amalfi, Monastero Santa Rosa is housed in a 17th century convent that dangles on a cliff between the road and the sea. The nuns have long since abandoned the premises, but there are reminders of the building’s past at every turn: small prayer rooms, frescos and paintings point to the religious past and the interior design has a certain simplicity to it. 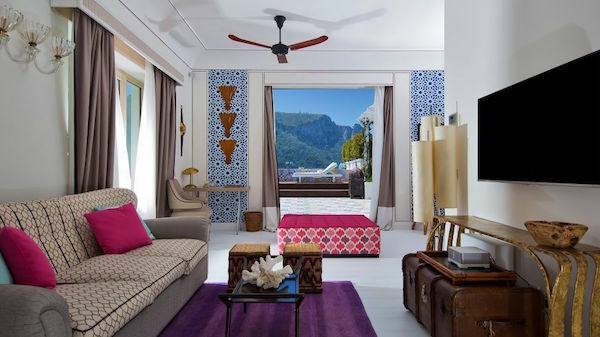 Rooms are simple and on the small size, but many have terraces with mesmerising views. Monastero Santa Rosa’s grounds spread over several terraced levels edging closer to the sea with the focus on the sea view from every point. Just outside Amalfi, this grand hotel sits among the citrus groves and bougainvillea with a delightful position next to the sea. The 55-room Hotel Santa Caterina is designed with family antiques, patterned tiles and bold fabrics that contrast with the white interiors. 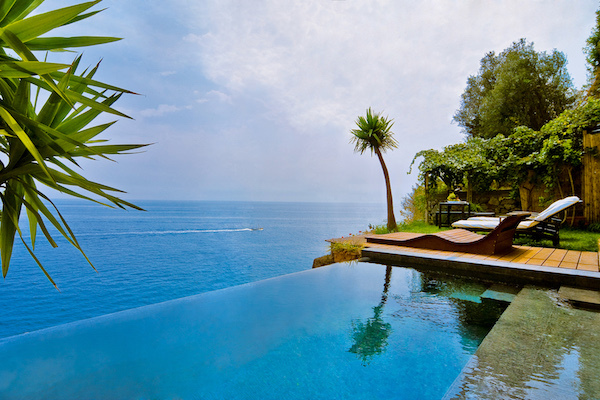 Hotel Santa Caterina is a place where warmth, character and romance abounds. Ravello is a small town of winding stone lanes and large historic mansions that sit behind stone fences in their orchards. 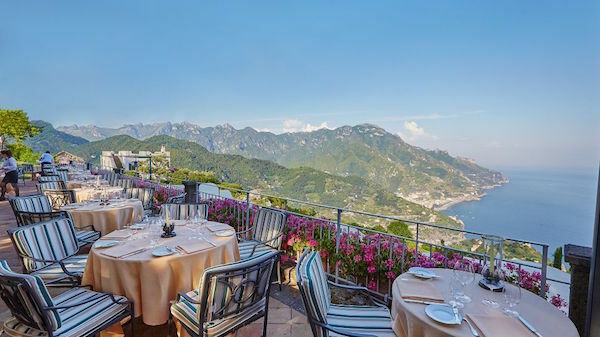 Unlike the busy towns on the coast that have a frantic air of tourism and sightseeing, Ravello maintains an air of aristocratic elegance where people come to relax. 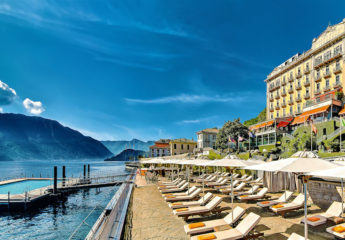 The Belmond Caruso is an intimate property of 50 rooms that are housed either in the main building or around the grounds towards the swimming pool. 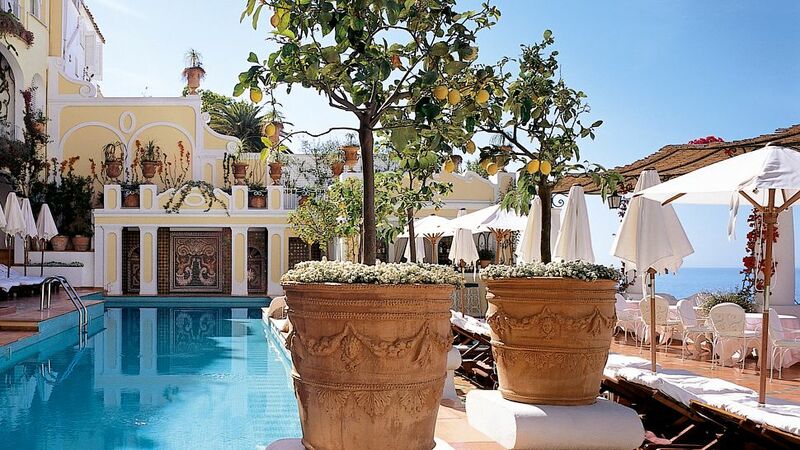 The pool is set to the side of the hotel, requiring a meander through the manicured and enchanting gardens of hanging wisteria, orange and lemon trees and fragrant honeysuckle. 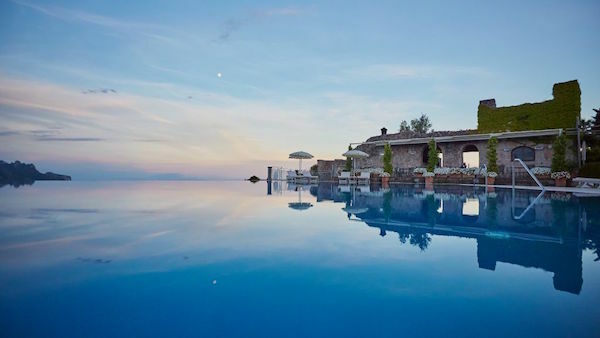 The pool is unsurprisingly designed to focus attention on the view, with a poolside restaurant famous for its Neapolitan pizzas from its on-site wood-fired oven. Guests are encouraged to take a nightcap after dinner in the main salon of the mansion with live piano music, creating the ambiance of a 1920s Agatha Christie novel, minus the murder. Right next door to the Hotel Caruso is the Palazzo Avino, which shares the spectacular cliff side views with its neighbour. Palazzo Avino was once a C12th private villa for an Italian noble family. 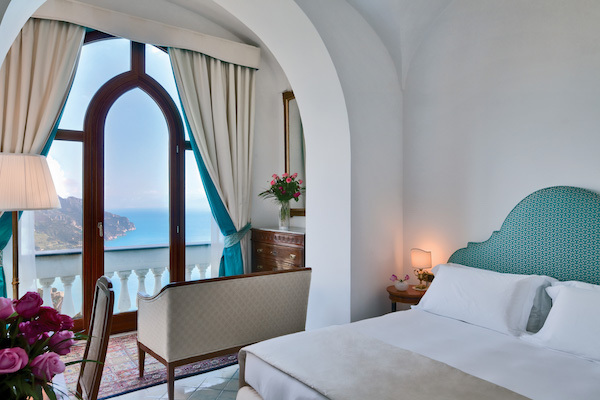 In 1997, it opened as a hotel and offers 32 refined rooms and 11 suites, all decorated with Vietri ceramics, antique carpets, linen fabrics, Bulgari furniture with views of the Mediterranean. Palazzo Avino’s 2 Michelin starred restaurant, Rossellinis, offers a delicate and refined twist on the traditional Italian. 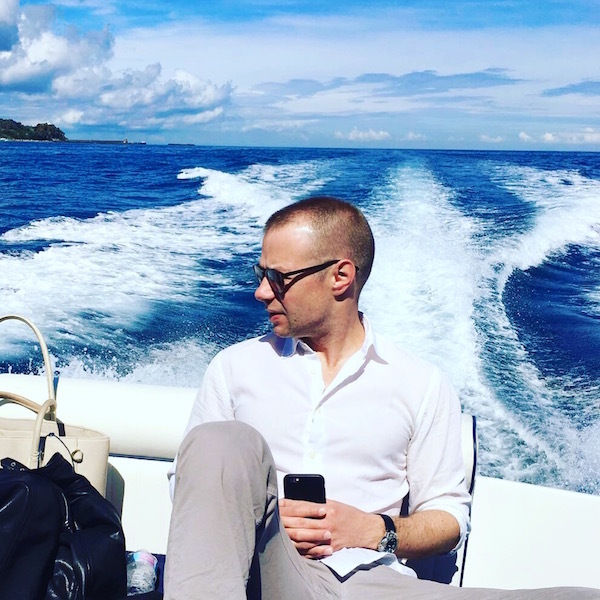 A visit to Capri requires a boat ride across the choppy channel separating the mainland from the Island of Capri. While private transfers are highly recommend (see picture below…), regular ferry services are offered throughout the day. The main town of Capri sits on a mountain above the port and is peppered with upscale boutiques, cafes, ceramic shops, and hotels, including the Capri Tiberio Palace. 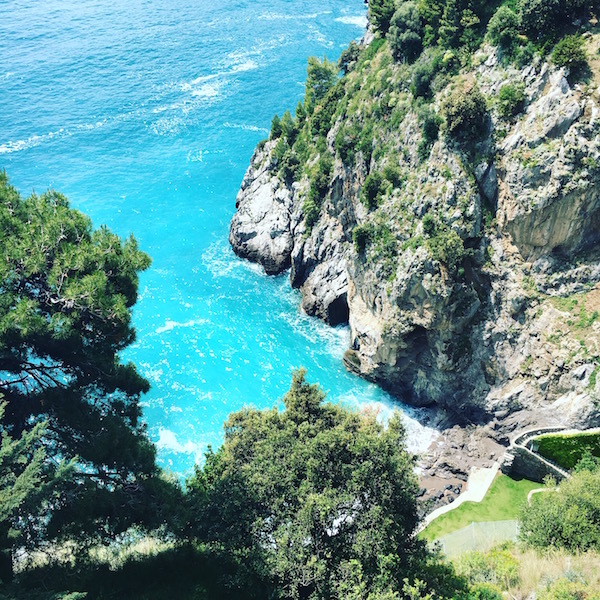 For those wanting to be in the middle of the action, the Capri Tiberio Palace has the ideal location, offering fabulous views over the town and the sea surrounding Capri. The hotel was recently restored in a contemporary chic style – each room is decorated in a different style, giving each room its own character and atmosphere. 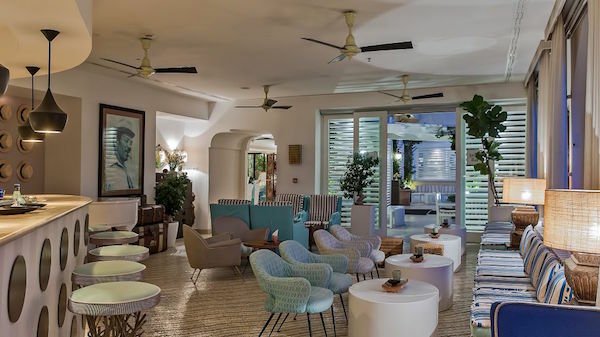 With a half in / half out swimming pool, excellent restaurant and cute bar, Capri Tiberio Palace is the choice for those who want to be in the town of Capri. 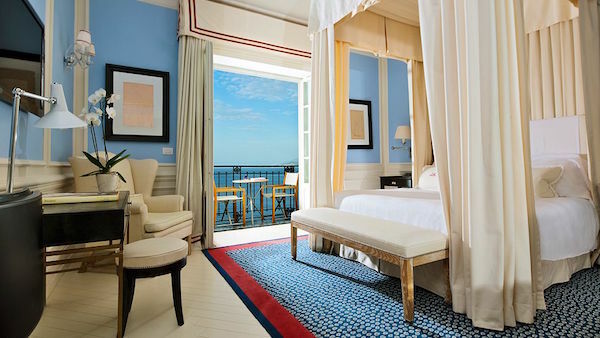 The Capri Palace Hotel is in the sleepier town of AnaCapri. The Capri Palace was built in the 1960s and maintains a mid-century glamour where the interiors are decorated with the owner’s personal collection of art work, sculptures and quirky installations. 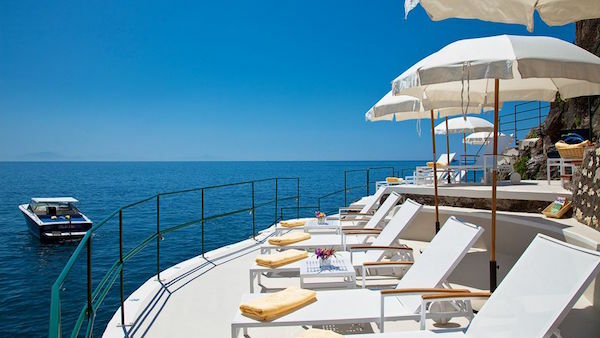 Anacapri’s location on a hilltop means that is physically removed from the cooling waters of the Mediterranean, but the Capri Palace’s shuttle service will take you to the hotel’s Michelin starred beach club, Il Riccio. For something more formal, dine in the hotel’s main restaurant, which has 2 Michelin stars. 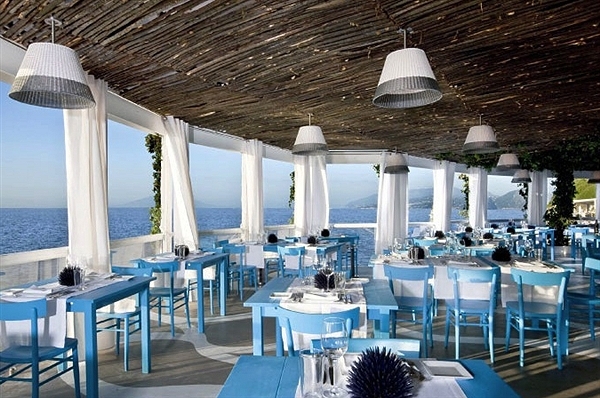 A short walk from the town of Capri is the incredibly chic JK Capri. With a gorgeous design of a fabulously stylish townhouse, JK Capri could be on the cover of any interior design magazine as an example of exquisite design. JK Capri has a large terrace that opens up from the hotel’s living room and library, which makes is an ideal spot for a pre or post dinner drink with Capri’s busy port in full view in the distance. The large outdoor pool is a big attraction in the summer, as is the restaurant, where lunch on the terrace to try the pasta dishes is a must! 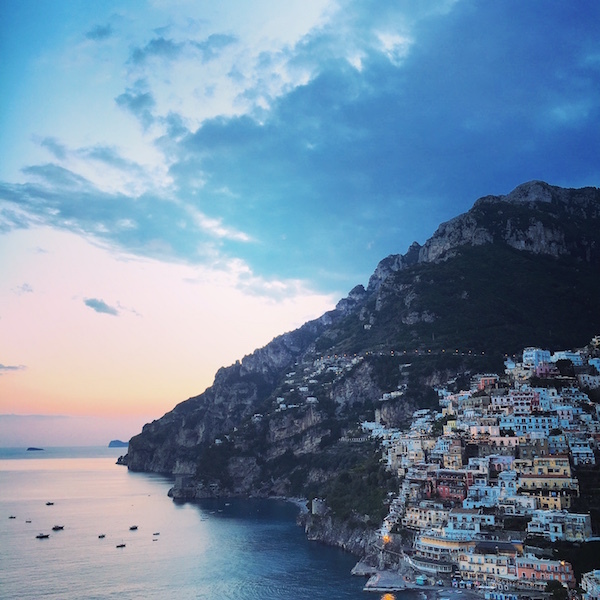 With its meandering roads connecting quaint villages, its rugged sea shore, dramatic hills and ceremonious cliff edges, the Amalfi Coast is as romantic and timeless as you could ever hope for. 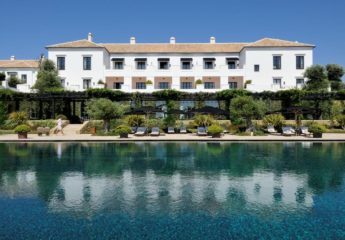 Read some of our other guides, including the best hotels in the Riviera Maya, our guide to Mallorca’s luxury hotels or our Ibiza travel guide.